Jenn Sherr, the decoupage diva, is known nationwide for her work that is at once intensely expressive and visually humorous. Nearly every medium is fair game. Her work includes fanciful furnishings and jewelry, fashion accessories, boots and shoes, totes and handbags, even the occasional golf bag. A reflection of her personality, nothing is sacred. She transforms the ordinary into the unexpected. 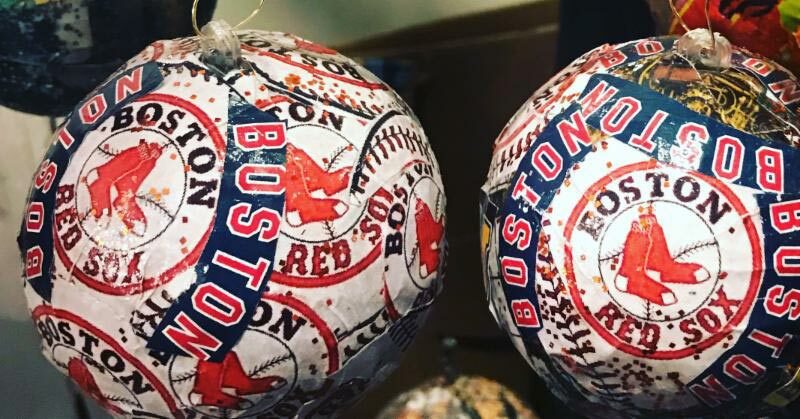 Her work has been collected by celebrities, including Oprah Winfrey, and can be found in boutiques throughout New England. Born in Worcester MA, her exploration of decoupage and faux painting began as a child, learning the art forms from her mother, who was a fashion model and artist. The pair have even exhibited together. A Martha’s Vineyard gallery hosted an exhibition of their work in a show called “Mirror Images”. The show contrasted their work, while illustrating how mother and daughter echoed each other’s aesthetic. 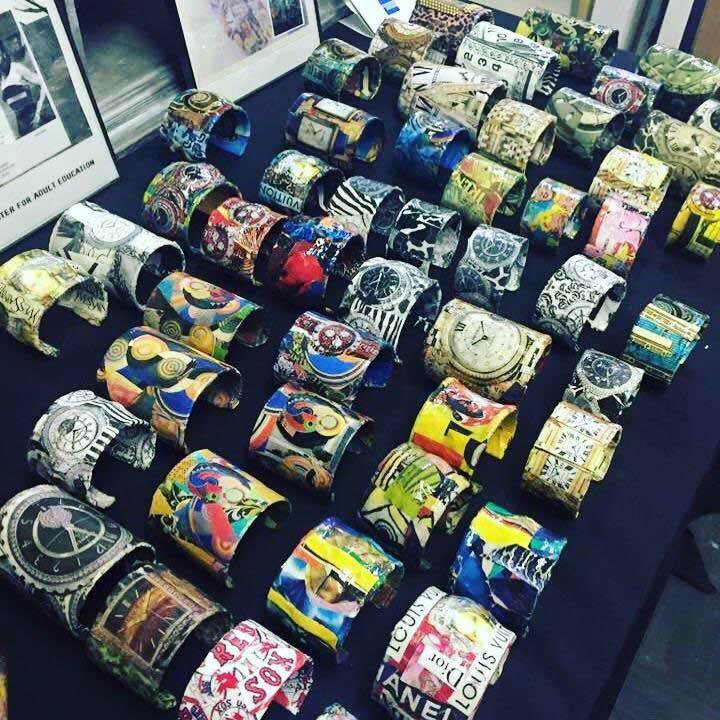 Combining decoupage and a love for fashion began in Miami, where her work as a stylist for many runway fashion shows inspired her first fashion decoupage pieces. The energy and variety of styles encouraged her to transform jewelry and accessories into unique works of art. A finalist in two Red Bull national “Art of Can” competitions, her fabulous boots and unique Red Bull enhanced handbag and platform shoes were highly regarded by the judges. You may see themes from Paris or Italy in her work. She travels for inspiration and is moved by expressions of love, striving to share her passion for life in the work she creates. 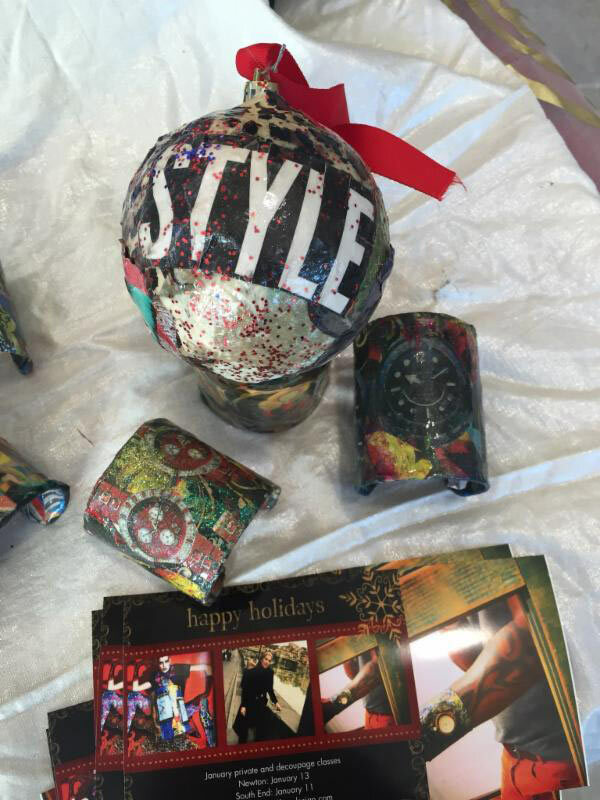 When not traveling or working in her studio, she teaches classes that bring the joy of decoupage to her students.